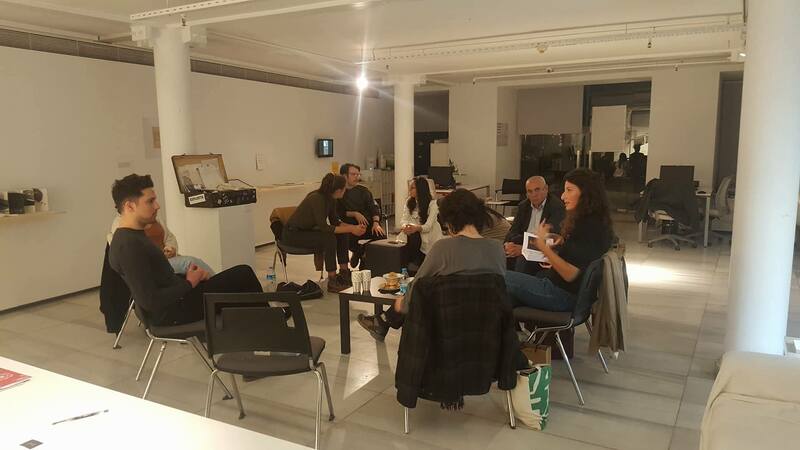 Founded by Gökcan Demirkazık, Mine Kaplangı and Naz Cuguoğlu, Collective Çukurcuma Reading Group will have monthly meetings and invite our friends to assign a reading, we will read, talk and discuss. 1.How do you think our perception of home has changed over the past decades, how we protect, shelter and express our identities within our domestic settings? 2.In current times where political problems are becoming more ungraspable and hard to overcome by individuals, what kind of strategies should one develop taking “the personal is political” motto as an anchor? 3.In “Convent Stories”, while Sofie Krough Christensen tries to get away from her familiar world as far as possible, she finds herself in a place that she initially wanted to distance herself from. Yet the stories the residents share and their willingness to share them with her, helps her to understand her own wanderlust and to let it go. In what ways neighbours affect our self-perception and what do our reaction towards our them say about ourselves? 4.In what ways has Obaidi’s “nomadic lifestyle” changed his perception of home? How is it possible to cope with the loss of a safe home, in a physical or emotional state? 5.In Dayanita Singh’s story, her father constantly remodels, expands and contracts their house. While the constant rebuilding of the house doesn’t offer a place of stability, she likes the fact that nothing was formally structured. If we assume that our own lives don’t come with a stable space from the start, will we be less afraid of the unfamiliar? 6.Is it possible to come to an agreement on the definition of “a good neighbour” in Istanbul from our little stories and encounters with our own neighbours? 1. Is it necessary to distinguish between raising children and the right to marry while assessing how ethical (or not) family-making is? If so, why? 2. Terre Thaemlitz suggests that families make democracy impossible. Which premises do they build this argument on? Do they believe in any essentialist argument (such as humanity is inherently evil)? 3. What kind of racial prerogatives are present (or not) in the testimonies we have read in Matt Sycamore Bernstein’s anthology? 4. How do chosen families function? What kind of consensual agreement is there among its members? Is it based on mutual profit? 1. What was the main relationship between the ethics and economy according to Deniz Yonucu’s interview on government violence and blacklisted neighbourhoods in Turkey? 2. What would be the main relation between the notion of neighbour and queer thought? 3. What do we understand from thinking “queer” and “queer studies”? 4. When we discuss people’s actions, what are the differences between “individual” and “singular” according to queer studies? 1) Clive Phillpot, “Twentysix Gasoline Stations that Shook the World: the Rise and Fall of Cheap Booklet as Art,” Art Libraries Journal, 18, no. 1 (1993): 4-13; reprinted in Phillpot, Booktrek (Zürich: JRP | Ringier, 2013). 2) Constance Moréteau, “Reading Spaces: Outside of any Typology,” in Open Books: Volumes A-E (London: Hato Press, 2015), 15-34. 3) Béatrice Joyeux-Prunel and Olivier Marcel, “Exhibition Catalogues in the Globalization of Art. A Source for Social and Spatial Art History,” Artl@s Bulletin 4, no. 2 (2016): Article 8. 1. What is the difference between artists’ books, booklets and bookworks? 2. What is the main motivation behind using artists’ books as a medium in artistic practises? 3. What is the political power of reading spaces and revolutionary potential of books? 1. How do the “trends” in academic publications, occurring time to time and observed all around the world, affect our view of the theories we work on? We have discussed the problematic of objectivity and unprejudiced approach to theories. 2. 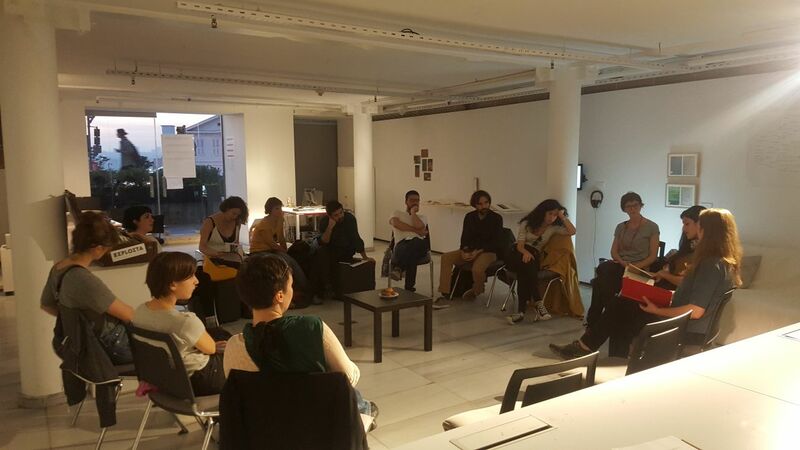 What is the importance of bienniales and biennial activities with regards to queer theory? Why do we gather reading groups, why do we need them? 3. From Grozs’ article how do we go back to Deleuze and Guattari? What does rhizomatics mean to Grozs as a methodology? 4. Comparative reading session of Chen’s and Spivak’s articles have taken place. 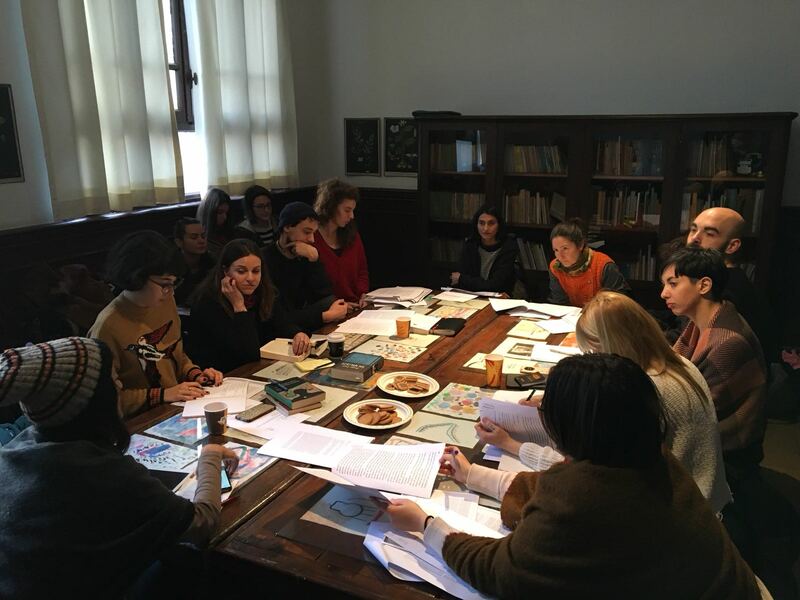 Separated into two groups (English and Turkish), we have discussed the artworks partaking in the 15th Istanbul Biennial through biennial venues and participating artists accompanied by biennial catalogues (exhibitions and stories). 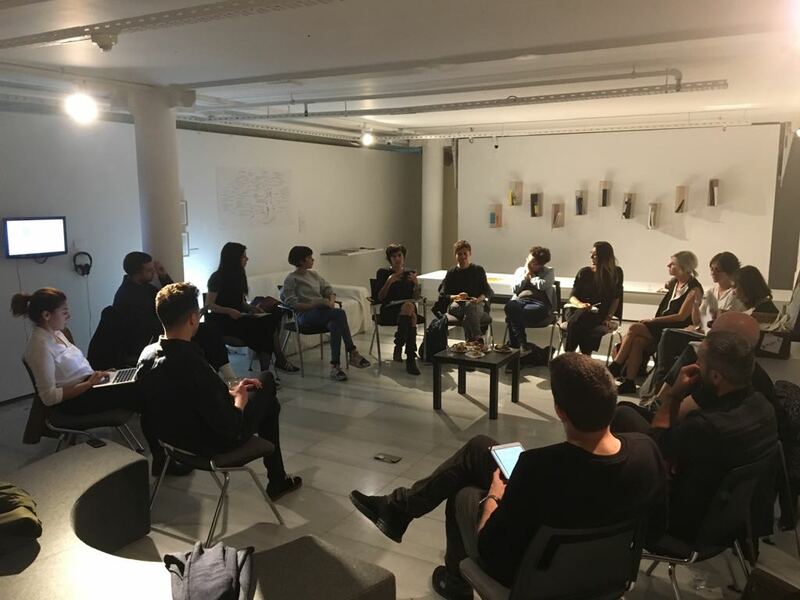 Afterwards, through our experiences on various artworks, we have created discussion questions and tried to examine and criticise the potential bond biennial created with the city itself. 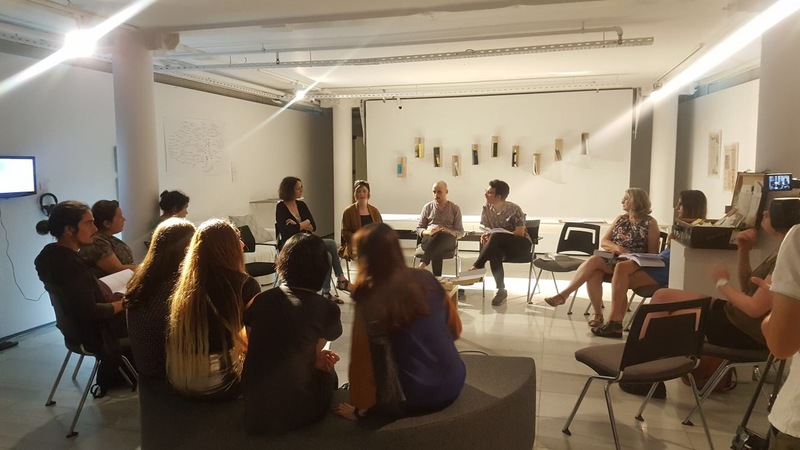 Then, we have questioned the relationships between the themes of “a good neighbour’ and House of Wisdom exhibition which was the part of the biennial’s public program supported with our reading group sessions. 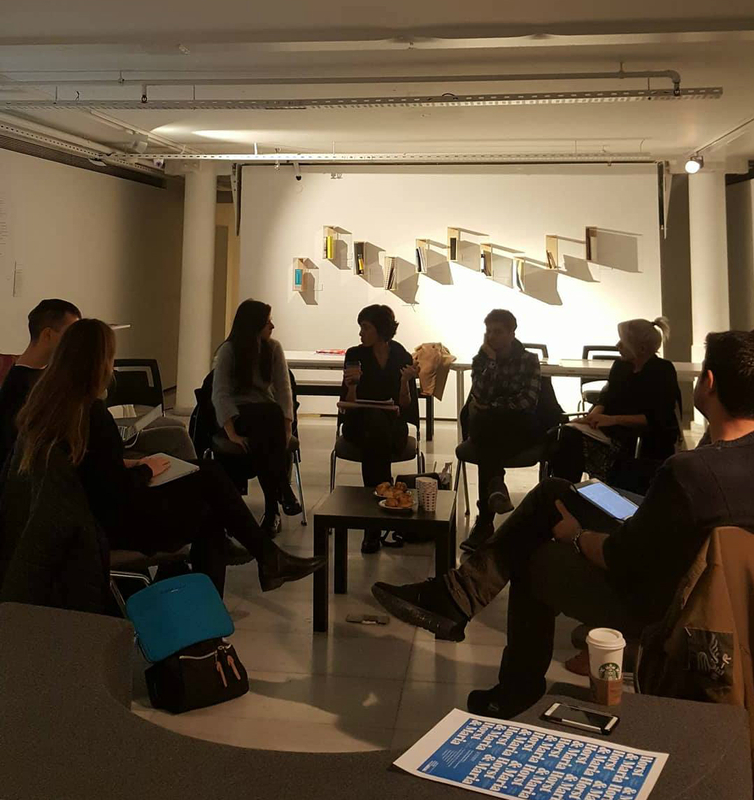 By retracing what we have read and discussed from day one, we have looked over the memory of biennial reading group’s archives’. What is the relationship between Aleph and collective consciousness? Can we think about all the experiences and feelings of humanity as cumulative? Commenting on the relationship between the “cellar” and the “unconsciousness”. Commenting on the concept of death and loss in three texts, and in the solo exhibition by Lara Ögel – thinking about the concept of communal mourning.